Blame it on the wing. 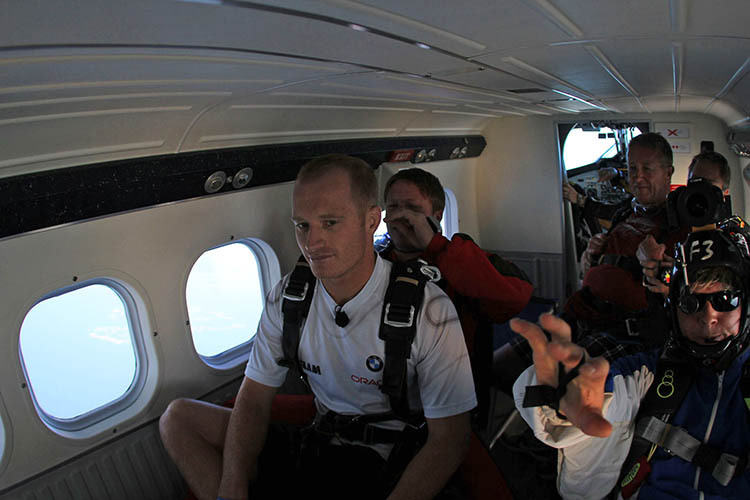 BMW ORACLE Racing skipper James Spithill has developed an affinity for death-defying aerobatic stunts. 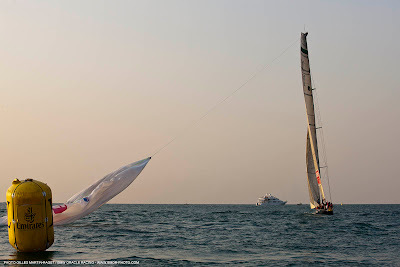 While learning how to sail the wingsail trimaran USA, he also gained his pilot’s license, reasoning that understanding how air flows across a wing would serve him well at the wheel of the 90-foot tri. 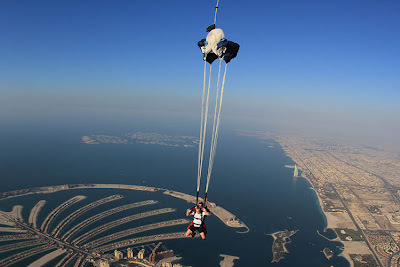 In August he flew aboard a stunt helicopter that did a reverse 360, one of only four in the world that can go upside down. 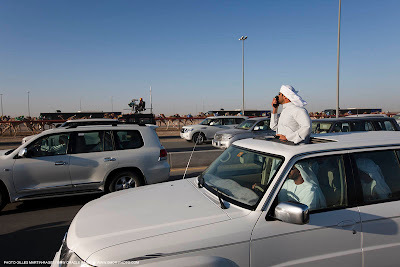 Last week in Dubai, he was at it again. 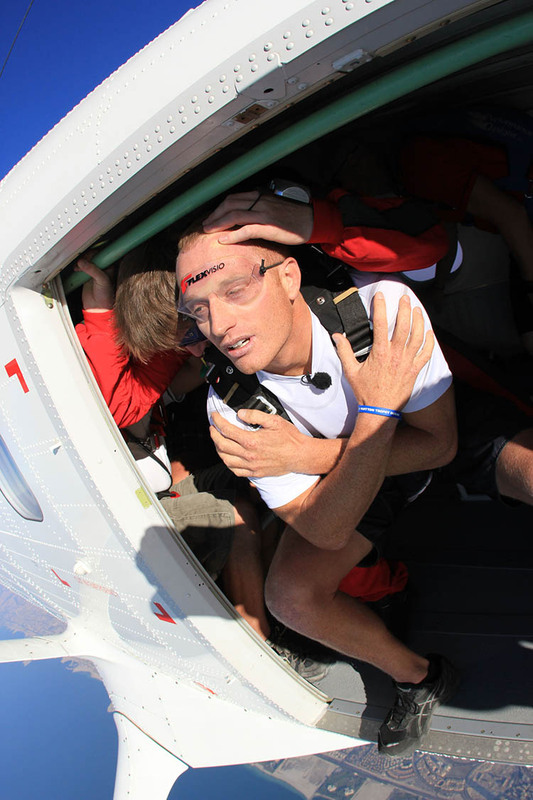 Spithill made the second skydive of his life during the lay day at the Louis Vuitton Trophy Dubai. 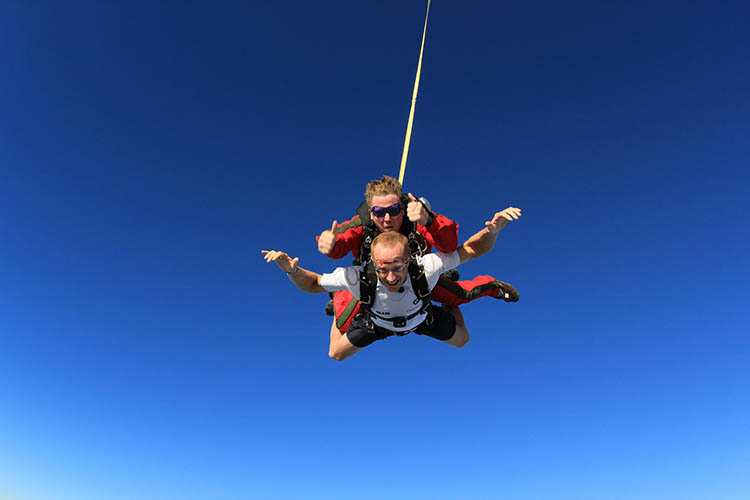 The jump from an altitude 13,000 feet was followed by a minute of free fall at terminal velocity – about 130 miles per hour – when the ripcord is pulled to pop the chute for a 5-minute ride to terra firma. Here the skipper shares his thoughts during the jump through the picture captions. 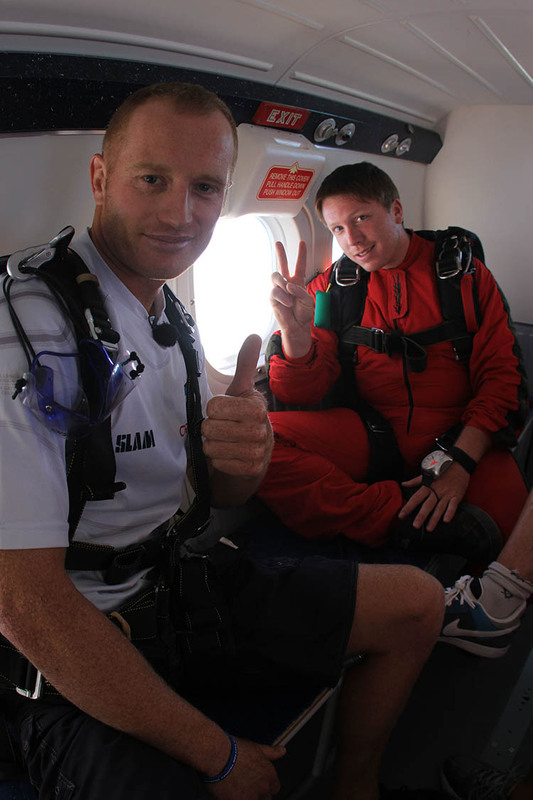 "Here I am with Chris in the plane on our way up, looking forward to the jump." 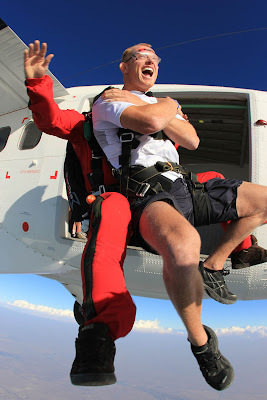 "Standing at the door he was telling me it's important to keep my head and feet back so we can do a back flip out of the plane..."
"...which was the best part of the whole experience. To jump out of a plane goes against all natural instincts. 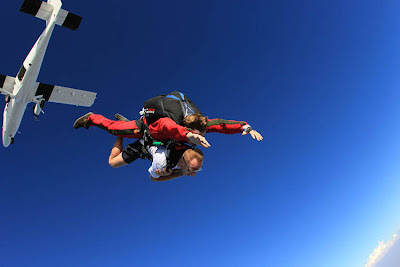 It was awesome!" 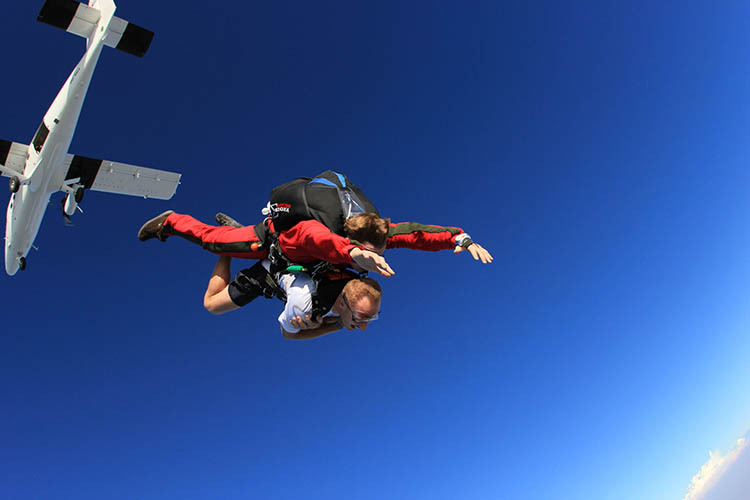 "Your guts drop initially, then you hit velocity and it feels normal." "I loved every second of it." "It was the best way to see Dubai." 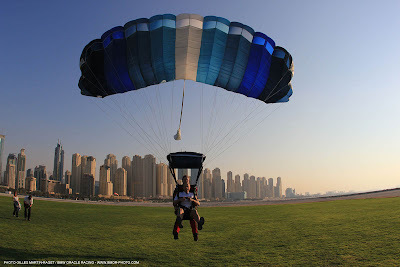 "When the chute popped it was quite a big jerk, but a good one." "We nailed the landing. 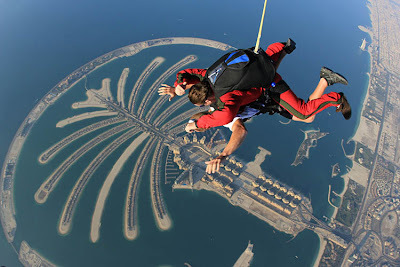 My only problem with the experience was that I couldn't immediately go again." And for those with rock-iron guts here's a video of the jump, which James made with yachting commentator Peter "big mouth" Lester of New Zealand. The end came sharply for BMW ORACLE Racing. 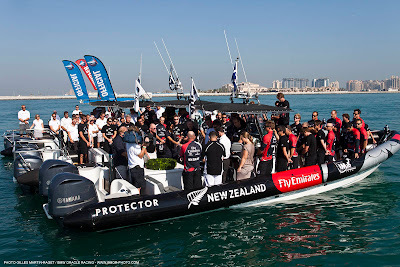 The crew had sailed splendidly for two weeks, but suffered a painful loss to Emirates Team New Zealand in the final despite leading at the first windward mark in both races. 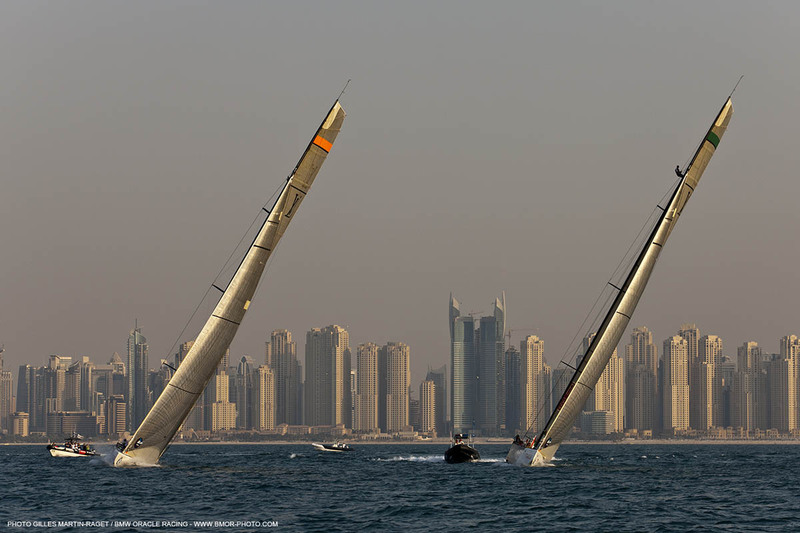 Team New Zealand boss Grant Dalton said they got lucky when the won the first race in the final jibe to the finish. With the Kiwis on match point, they sealed the victory in the second race. Watch skipper James Spithill and tactician John Kostecki relive the day. BMW ORACLE Racing fell short of its goal of winning the Louis Vuitton Trophy Dubai, the final regatta for the America’s Cup Class, when Emirates Team New Zealand scored a 2-0 victory in the final. 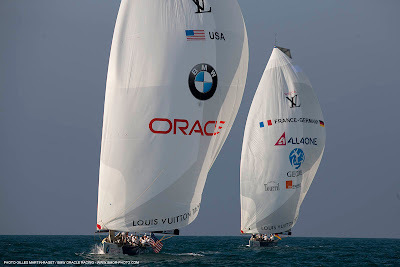 BMW ORACLE Racing led at the first windward mark in both races, but succumbed to uncharacteristic mishaps in crew work that their strong rival capitalized on. 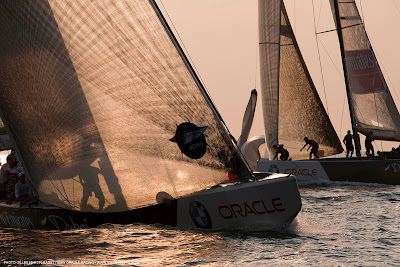 BMW ORACLE Racing lost the first race by 17 seconds in the final 100 meters approaching the finish line. 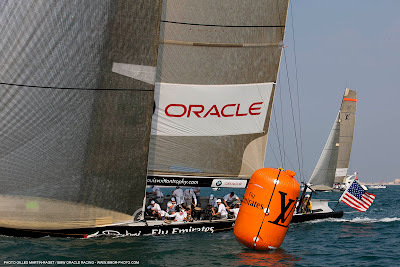 BMW ORACLE Racing had taken a penalty turn for a pre-start infraction on the second upwind leg and led by about two boatlengths when the two crews jibed towards the finish from opposite sides of the racecourse. The Kiwi crew jibed into a patch of wind that allowed them to sail a more direct course to the finish and score the come-from-behind victory. 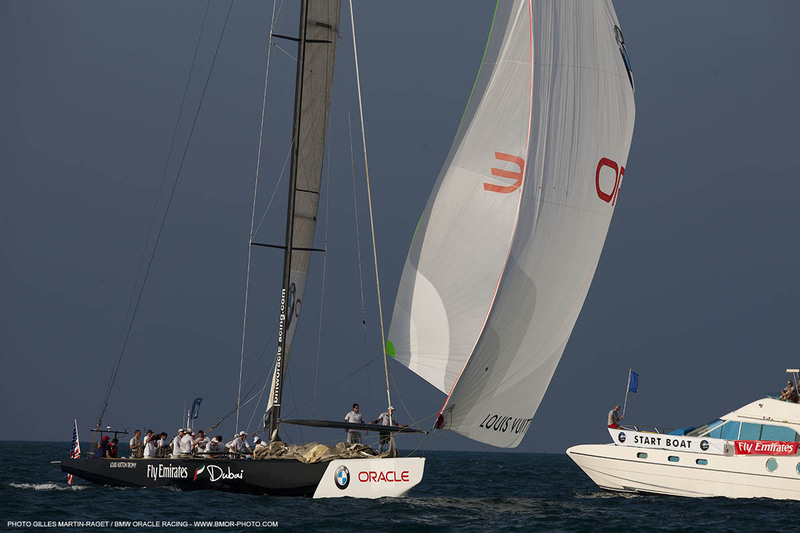 In the second race BMW ORACLE Racing led by 11 seconds at the windward mark, but the spinnaker ripped during the set when it caught on the ladder going belowdecks. 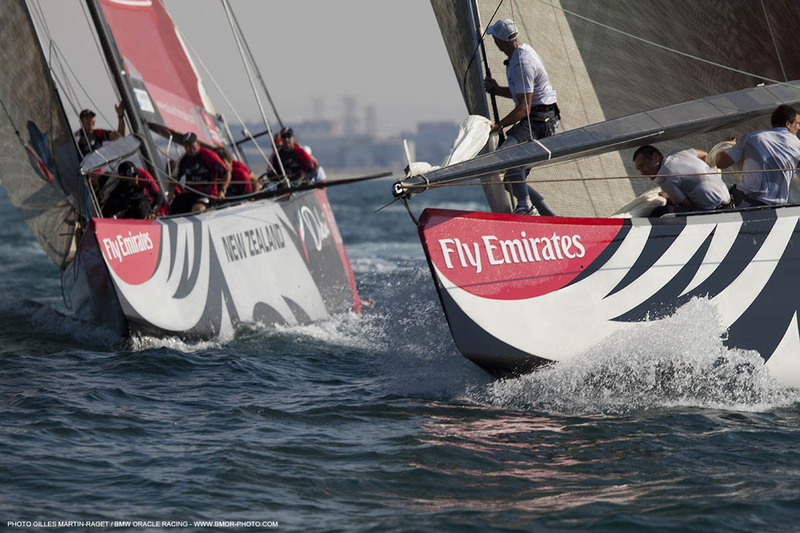 The crew had to change sails and Emirates Team New Zealand sailed into the lead. Tactician John Kostecki of the U.S. described the conditions as between 6 and 9 knots with shifts up to 40 degrees. 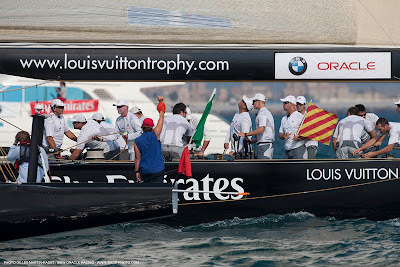 BMW ORACLE Racing skipper James Spithill recaps the team's 2-0 triumph over All4One in the semifinal round of the Louis Vuitton Trophy Dubai. 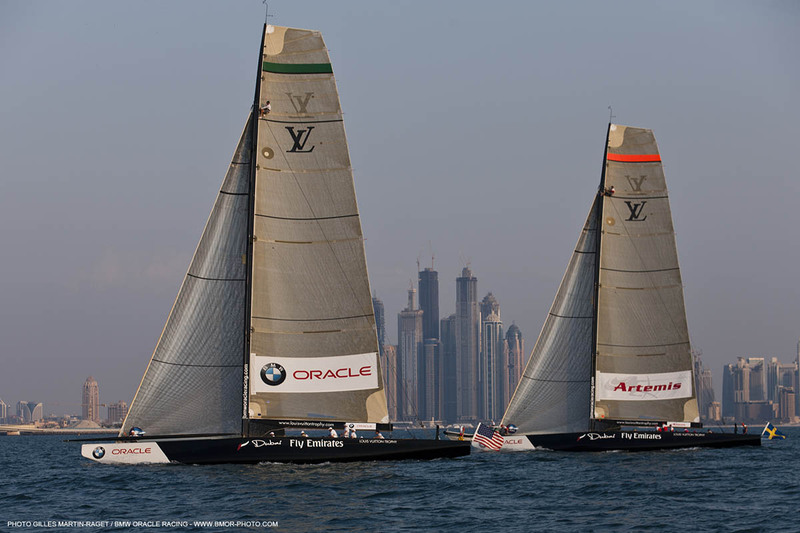 BMW ORACLE Racing advanced to the final of the Louis Vuitton Trophy Dubai, the fitting finale for America’s Cup Class monohulls, with a sterling performance in today’s semifinal round. 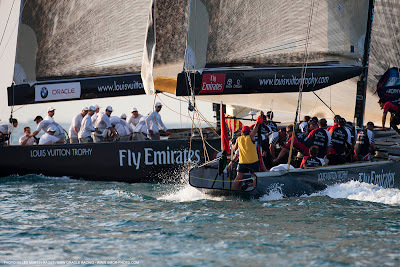 Led by skipper James Spithill, the American team, which won the 33rd America’s Cup in February, defeated the German/French All4One crew 2-0 to advance to the final where it will meet Emirates Team New Zealand, also a 2-0 winner in the semifinal round. The winning formula for today was as it’s been throughout the regatta that began 13 days ago. Tactician John Kostecki and strategist Murray Jones called the windshifts with aplomb and trimmers Dirk de Ridder (mainsail), Ross Halcrow (headsails) and Joey Newton (spinnakers) kept the boat moving fast. Not to mention, the sailhandling at the turning marks was flawless. Spithill has been spot on too, especially in the pre-start sequence. Once again, he gave his crew the ability to call free races by winning the starts. 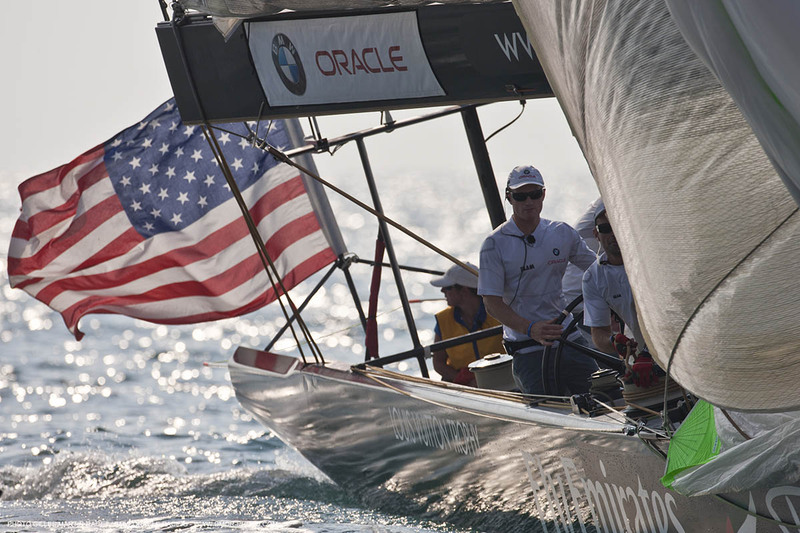 In the first pre-start, Spithill got a penalty on All4One for jibing too close. 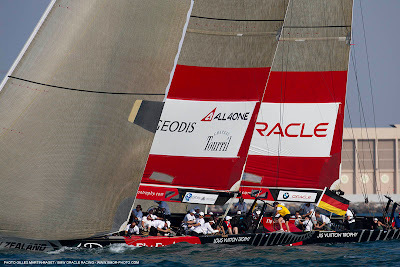 That penalty came in handy during the second upwind leg when All4One closed to within one length as the two crews combined for 25 tacks in a furious duel. In the second race the two crews came off the line at opposite ends, but BMW ORACLE Racing was at speed at the pin end while All4One was tacking to starboard at the committee boat, making the French/German team slow off the line. 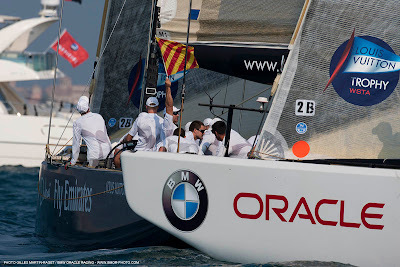 After entering onto the racecourse, BMW ORACLE Racing quickly tacked to port to get to the right and take advantage of the downspeed All4One and a right-hand windshift. 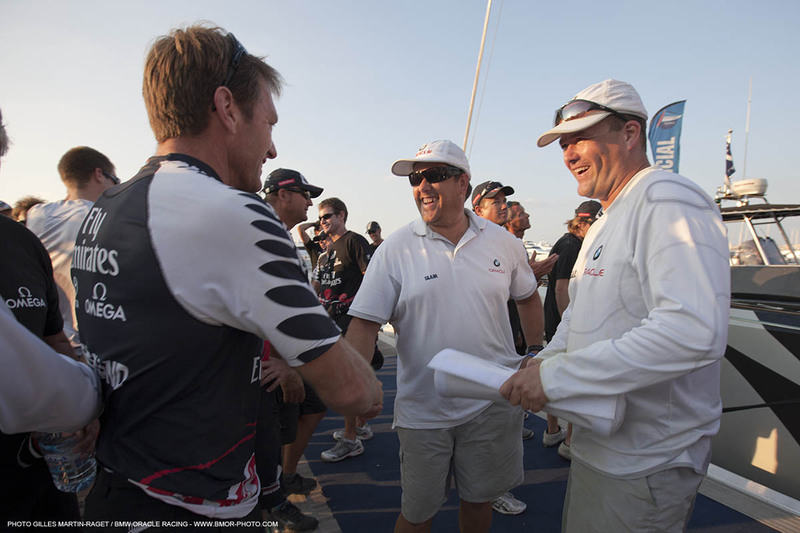 Tomorrow’s final against Team New Zealand pits Spithill against old rival Dean Barker. The two raced the Louis Vuitton Cup final during the 32nd America’s Cup in 2007. 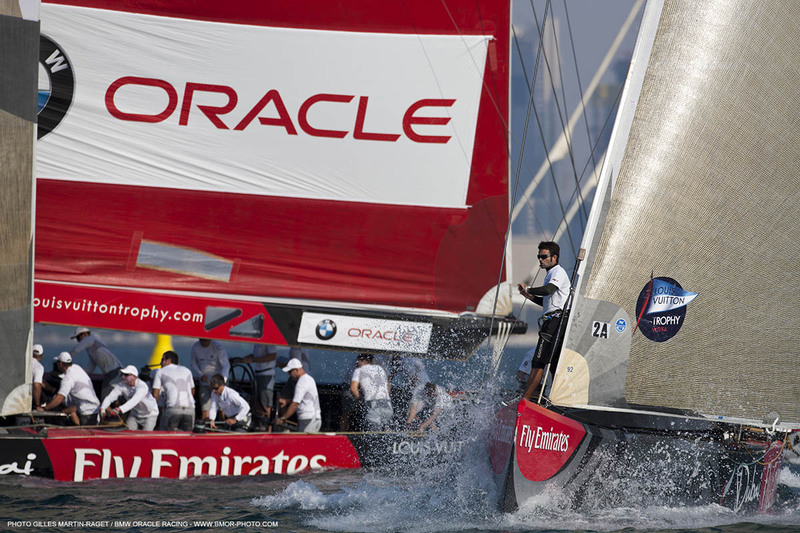 It’s a showdown Spithill is looking forward to. 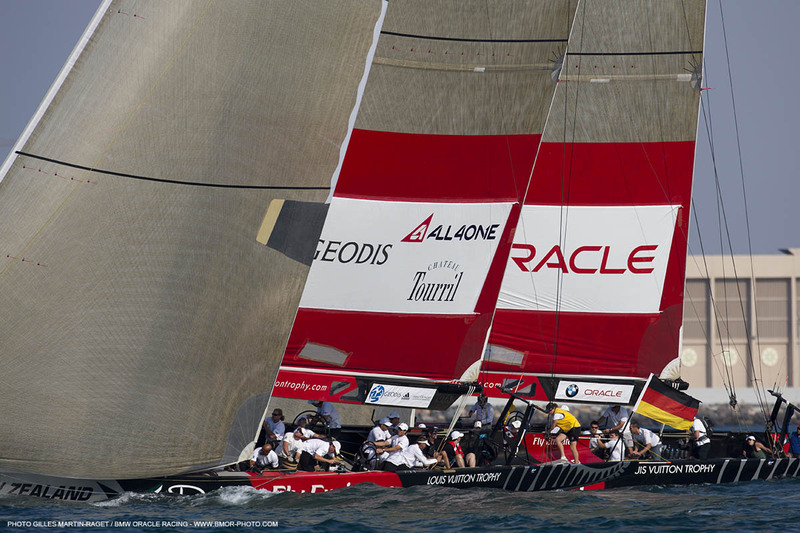 “I’m convinced we haven’t seen our best yet, so I’m looking forward to tomorrow,” Spithill said. Members of BMW ORACLE Racing joined others at the Louis Vuitton Trophy Dubai this morning in a service remembering the 29 miners who perished last week in an explosion at the Pike River coal mine on the west coast of New Zealand’s South Island. 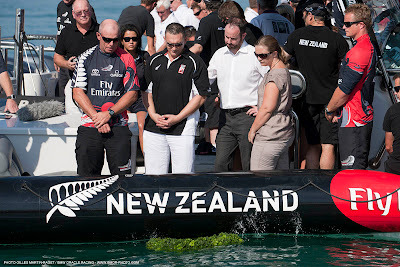 The remembrance was organized by Emirates Team New Zealand and attended by the entire Team New Zealand crew. 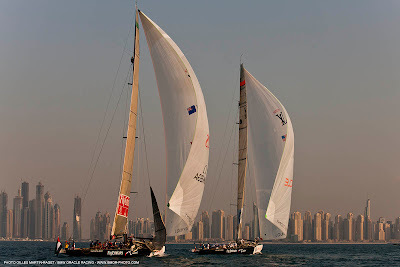 Also attending were Wayne Mikkelsen, New Zealand Consulate General and Trade Commissioner based in Dubai, plus Kiwis from other syndicates and regatta operations and associated members of the Cup community. The names of all 29 miners were read. Grant Dalton, Team New Zealand’s CEO, laid a wreath in the Persian Gulf that was followed by a moment of silence. 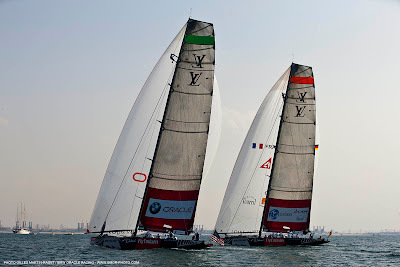 BMW ORACLE Racing, winner of the 33rd America’s Cup, will meet All4One, the combined French/German team, in the semifinal round of the Louis Vuitton Trophy Dubai. 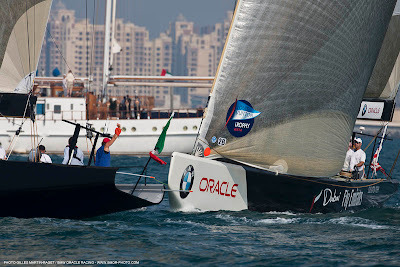 Led by skipper James Spithill of Australia, BMW ORACLE Racing won the right to choose its semifinal opponent by winning the round robin with a 13-2 record. “It’s never an easy choice, but we chose All4One simply for the fact that we won the round robin and they finished fourth,” said Spithill, who also could’ve chosen Emirates Team New Zealand (2nd place) or Mascalzone Latino Audi Team (3rd place). 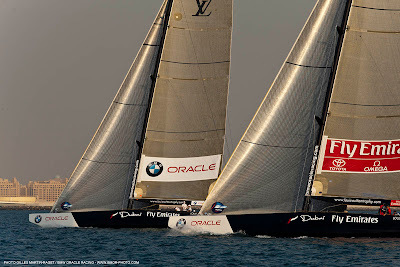 BMW ORACLE Racing went 2-1 versus All4One in the round robin. 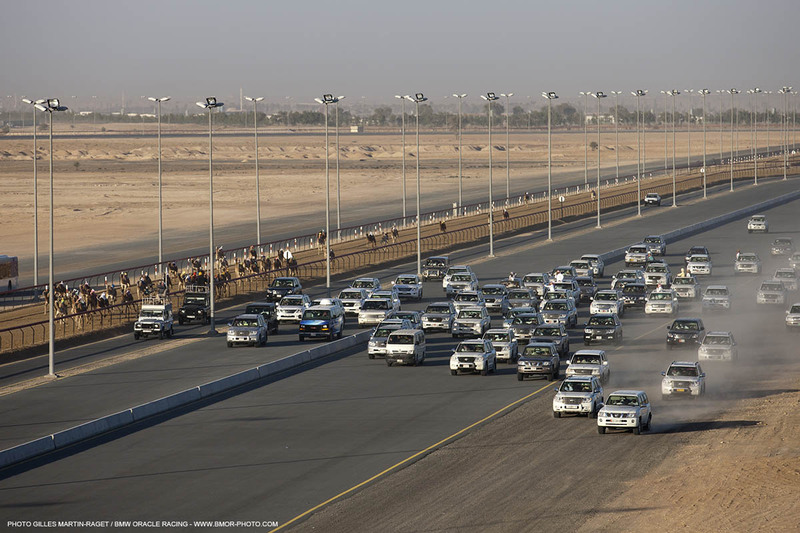 The American team won the first two races in Round 1 and All4One won the only meeting in Round 2. “Everyone’s geared up for tomorrow, it should be fun,” Spithill said. The winner of the match will be the first to score 2 points in a best-of-three format. The two semifinal winners advance to the final of the event, scheduled for Saturday. The wind conditions tomorrow are forecast to be light and racing likely won’t begin before 1:00 pm. 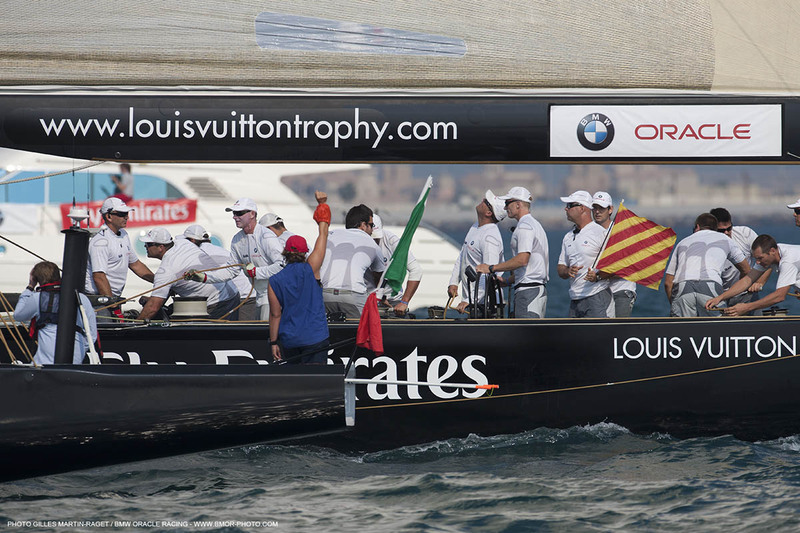 BMW ORACLE Racing mainsail trimmer Dirk "Cheese" de Ridder reviews the team's final race of the round robin at the Louis Vuitton Trophy Dubai, a 51-second victory over Mascalzone Latino Audi Team. 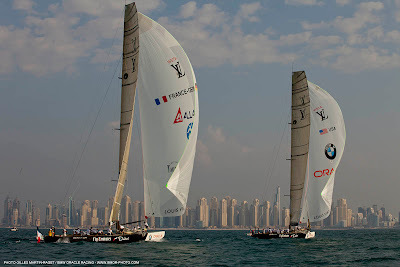 BMW ORACLE Racing, led by its 31-year-old skipper James Spithill of Australia, advanced to the semifinal round of the Louis Vuitton Trophy Dubai as the top-ranked team with 17 points on a 13-2 record. 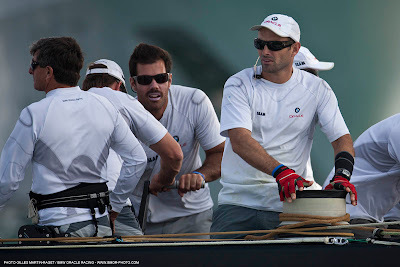 The American team wrapped its account of the round robin series with a 51-second victory over Mascalzone Latino Audi Team, the Challenger of Record for the 34th America’s Cup. By winning the round robin BMW ORACLE Racing earned the right to choose its opponent when the next round begins on Friday. 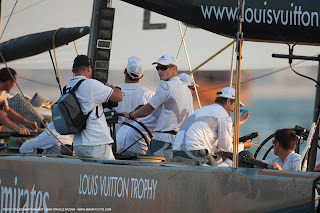 Spithill has done a masterful job in the pre-starts, the afterguard of John Kostecki, Murray Jones and Ian Moore has made sound calls on the racecourse, and the crew has performed cleanly in all maneuvers. Credit goes to the crew and coaches Philippe Presti and Dean Phipps for breaking down every position and rebuilding it with confidence. Today’s race, however, might’ve been won yesterday when Mascalzone Latino scored two victories and moved up the leaderboard into third place, nearly guaranteeing itself a spot the semifinals. The only thing that could’ve prevented the Italians from advancing was penalty points from the umpires, and they sailed knowing that consequence. 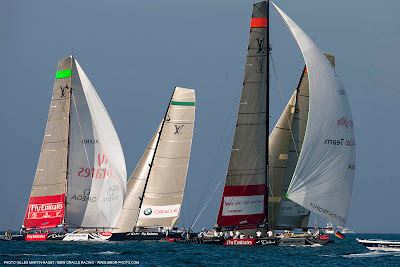 Although determined to avoid close-quarters situation, Mascalzone was penalized during the pre-start sequence when it got too close to BMW ORACLE Racing, on starboard tack, while backing down. 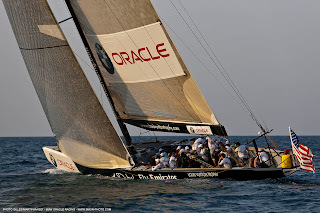 Joining BMW ORACLE in the semifinals are Emirates Team New Zealand, Mascalzone Latino Audio Team and All4One, the combined French/German team. Tomorrow is a scheduled lay day at the regatta that runs through Saturday. Thursday’s schedule calls for fleet racing before the semifinals on Friday. Semifinal picks must be made by Thursday night, but there’s no indication from the crew as to their preference. “That’s up to the chiefs,” said de Ridder. On Day 9 of the Louis Vuitton Trophy Dubai BMW ORACLE Racing defeated Emirates Team New Zealand to run its record to 12 wins in 14 starts. 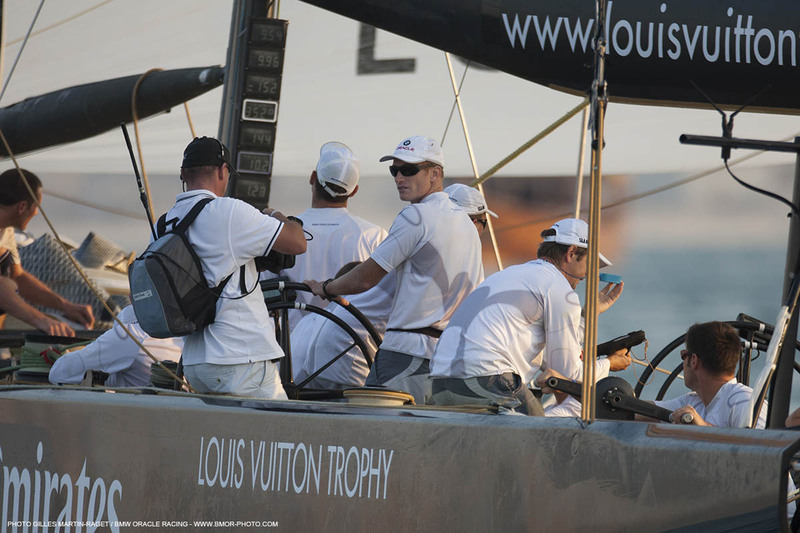 Skipper James Spithill and crew gained control of the match in the first meeting on the opening upwind leg. 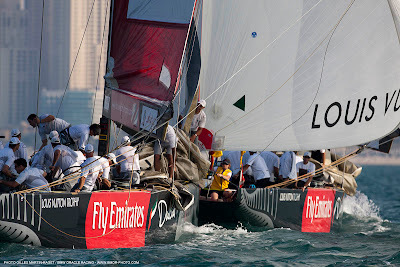 Through the leeward gate Team New Zealand had problems dousing its spinnaker and had to cut the sail away. Relive the race with Dean Phipps, who wears many hats for the team including crew coach, runners and pit assist. 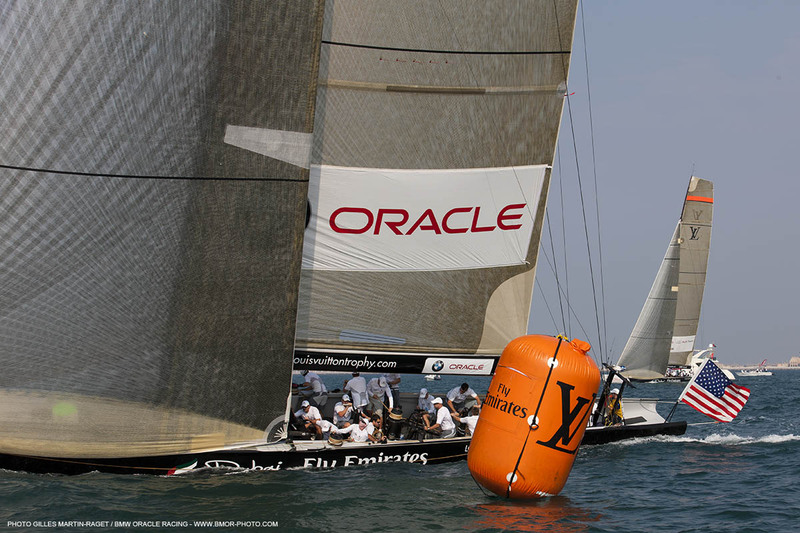 BMW ORACLE Racing clinched the top spot in the double round robin of the Louis Vuitton Trophy Dubai with a victory today over Emirates Team New Zealand. Led by Australian skipper James Spithill, BMW ORACLE Racing defeated the Kiwi crew by 25 seconds. 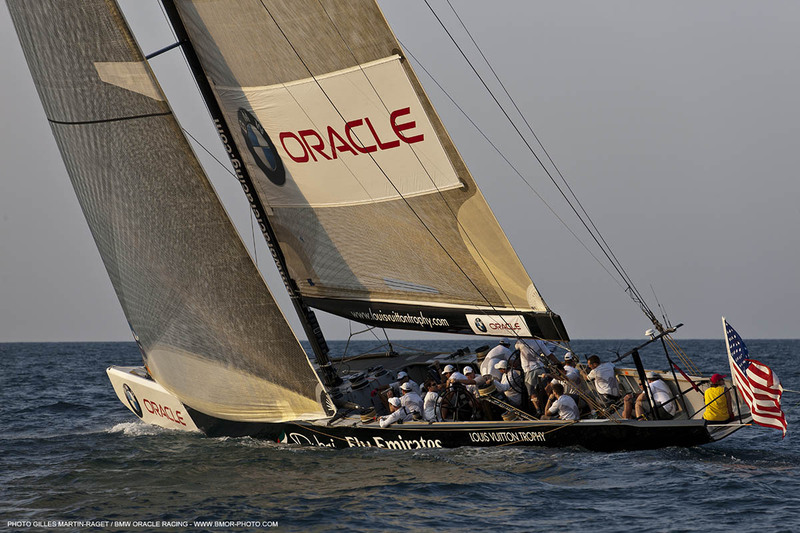 The win improved BMW ORACLE’s record to 12-2, good for 15 points and an unassailable position atop the leaderboard. 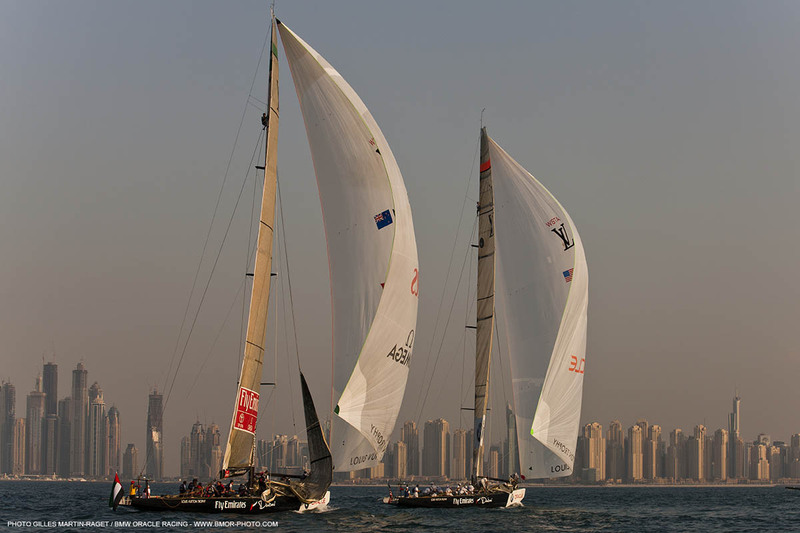 Sailing in a light northerly wind, the pre-start action was relatively tame. 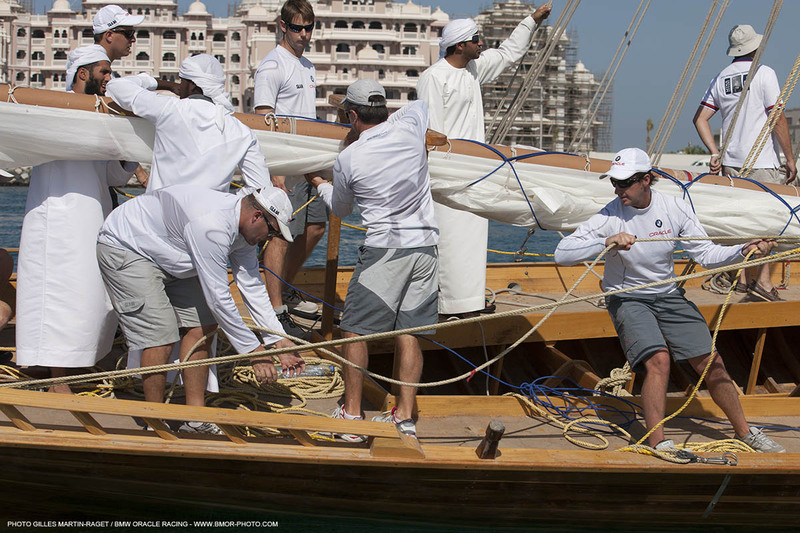 Both crews are experienced and knew that keeping momentum after breaking off the dial-up was key. 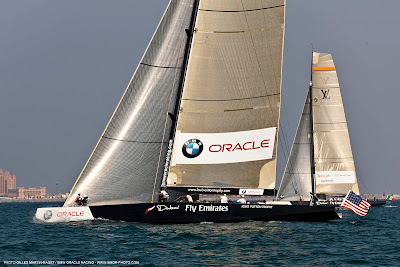 BMW ORACLE tactician John Kostecki called for the right side of the start and Spithill obliged, bringing his crew onto the racecourse on starboard tack with Team New Zealand to leeward. Both boats soon tacked to port and stretched out to the right edge of the racecourse. BMW ORACLE tacked to starboard and was able to force Team New Zealand to tack to leeward. 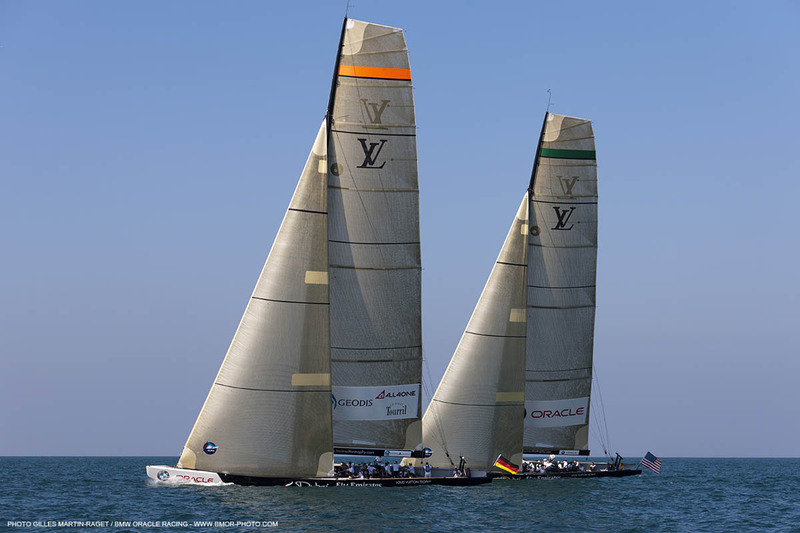 The American yacht rounded the windward mark with a 10-second advantage. 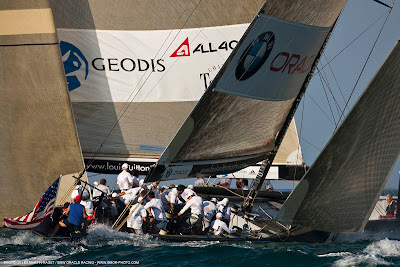 The two crews traded jibes down the run and BMW ORACLE set up for a port rounding through the leeward gate. 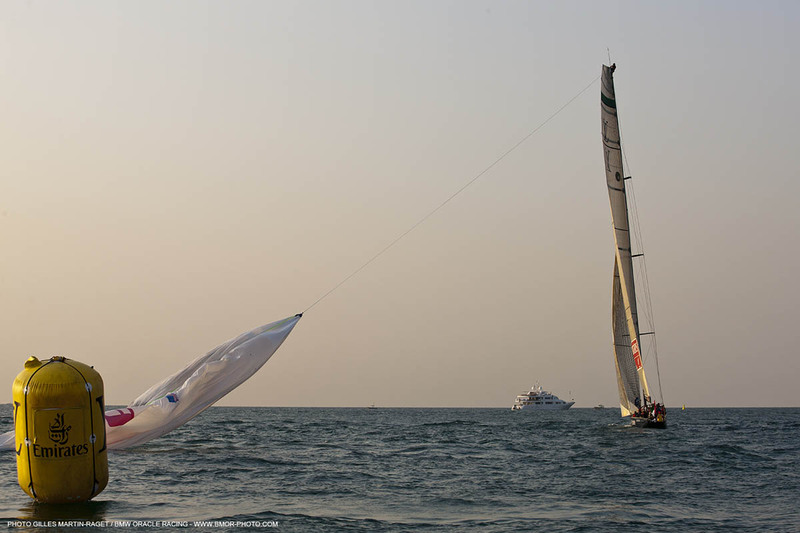 Team New Zealand followed but lost control of the spinnaker takedown. 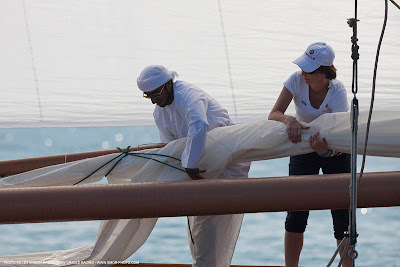 The sail fell in the water and the crew had to cut the halyard away. Riding aboard BMW ORACLE Racing today as 18th person was Christine Belanger (right), the Louis Vuitton representative who has helped organize the Louis Vuitton Trophy events with the World Sailing Teams Association. Tomorrow BMW ORACLE Racing concludes the round robin with a race against Mascalzone Latino Audi Team. The semifinals are slated to start on Friday, and the American crew will have the right to choose its opponent by winning the round robin. 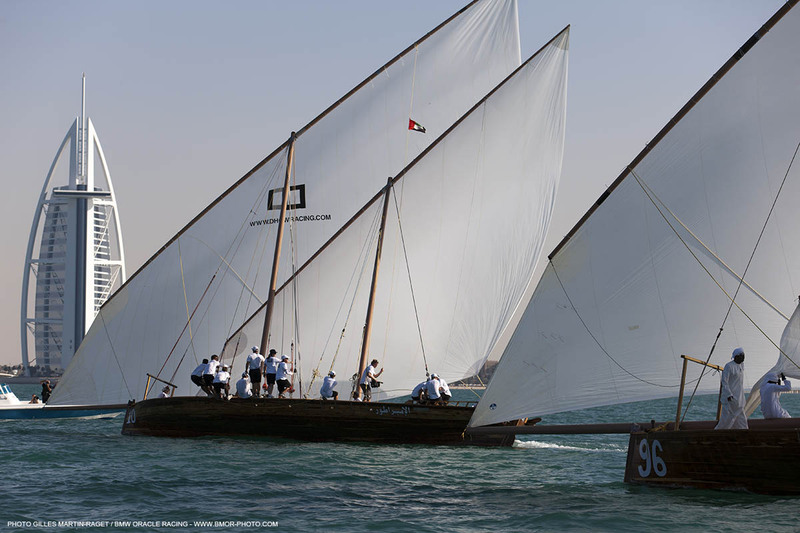 On Saturday BMW ORACLE Racing teammembers participated in the Heritage Day Dhow Race. 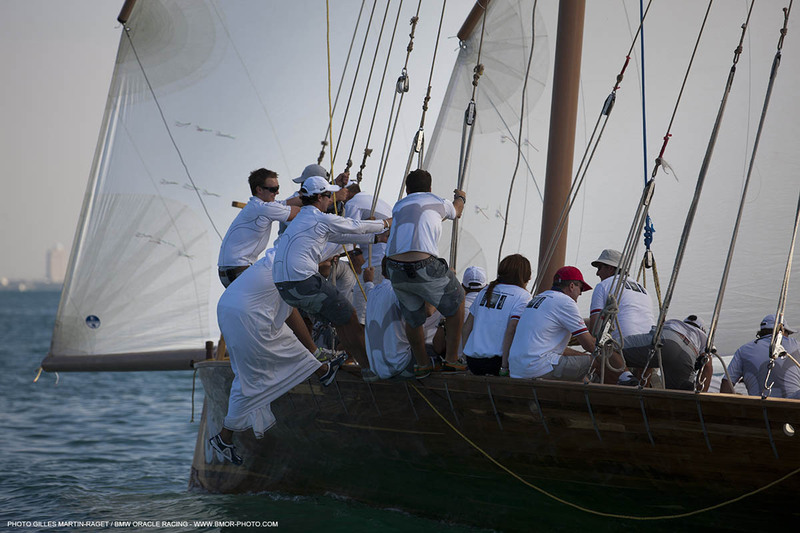 Go aboard with the team as they hoist the sails and race the hundreds of centuries old wooden craft. By splitting its two races today BMW ORACLE Racing maintained the top spot at the Louis Vuitton Trophy Dubai. BMW ORACLE Racing skipper James Spithill and his crew split their races against All4One, the combined French/German team, and the Swedish flagged Artemis Racing, a challenger for the 34th America’s Cup. 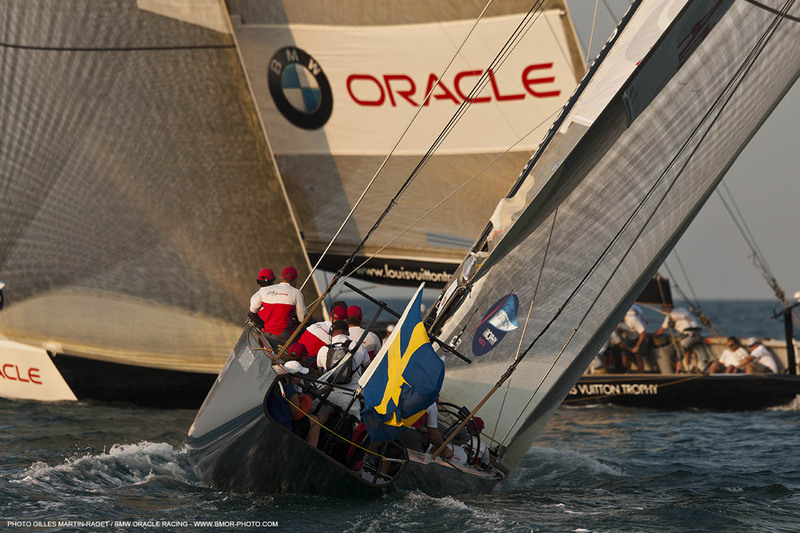 BMW ORACLE defeated Artemis by 1 minute and 3 seconds in the second race while All4One scored a 45-second victory in the first. 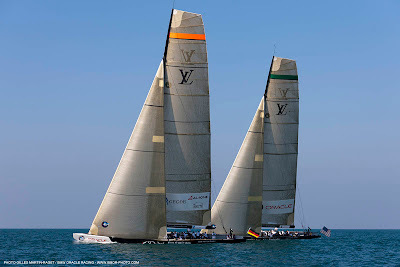 “It was a little disappointing to lose the first race, but give credit to All4One,” said Ian Moore, the navigator from England. 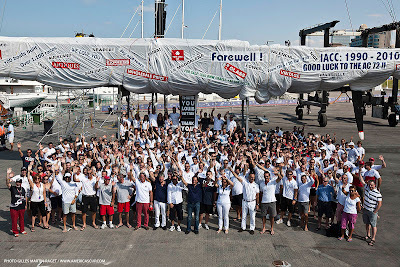 “They started well and sailed impeccably well. We see a lot in these races that if you win the start it helps to go on and win the race, and that’s what they did. 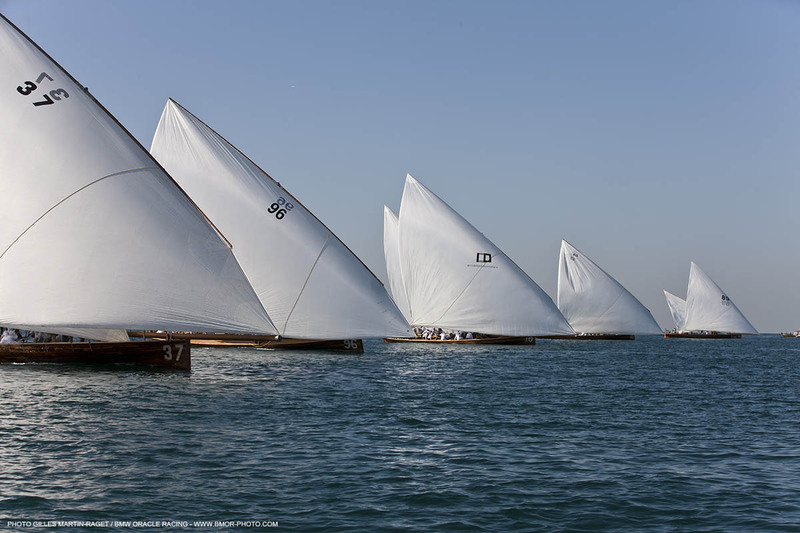 Day 8 of the regatta that runs through next weekend got off to a slow start as the race committee postponed the first start for more than two hours waiting for the wind to settle. 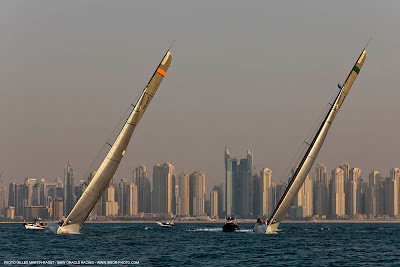 Once in, the conditions were some of the lightest of the week, 6 knots from a northerly direction. In the first race, the key moment came about two-thirds of the way up the beat. BMW ORACLE and All4One approached each other on opposite tacks, with BMW ORACLE holding the starboard advantage. But All4One was able to tack to starboard on the leeward bow of the American yacht and gain control of the match. In the second race Spithill gave his crew an early advantage off the start line, crossing the line as the starting signal sounded while Artemis was slow and a few seconds late, but to windward. 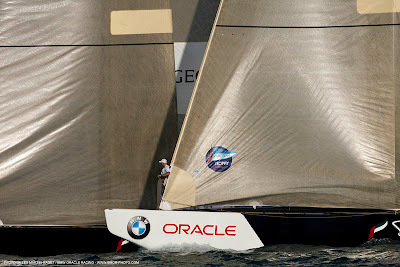 The key moment came about 2 minutes in when BMW ORACLE was able to ride port tack across the bow of Artemis and plant a covering tack. 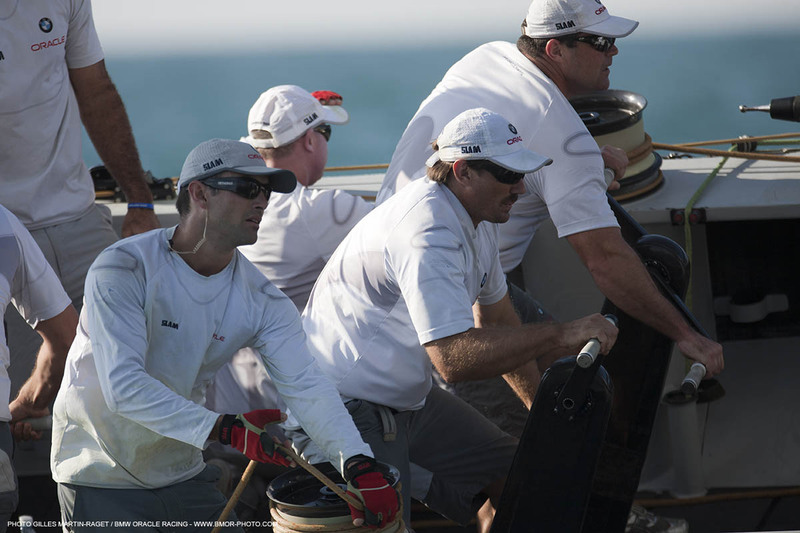 From there Spithill and crew covered to sail away to their largest win of the series. 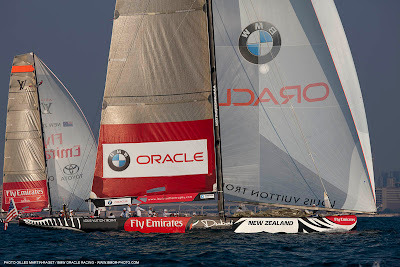 The win improved BMW ORACLE Racing’s record to 11-2, good for 13 points, and allowed the team to keep its 4.5-point cushion over second-placed Emirates Team New Zealand on the leaderboard ahead of tomorrow’s showdown race. 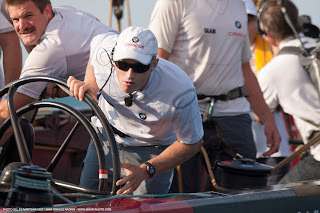 The pair is the third scheduled match of the day and will race in BMW ORACLE Racing’s two boats. 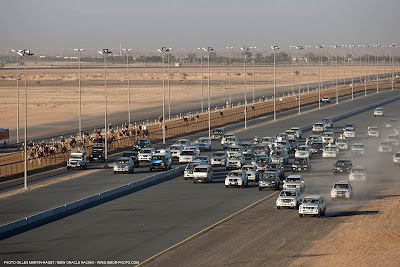 From camel racing to dhow racing, today’s off day at the Louis Vuitton Trophy Dubai had enough variety to rival television shows such as Laugh In. 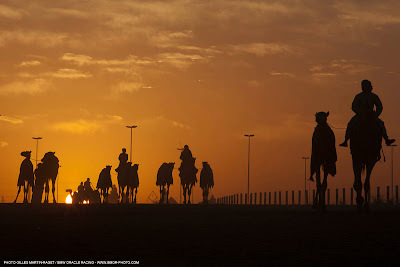 The day started at dawn with a trip to the desert to watch camel racing. The racing takes place in the early morning hours to avoid the midday heat. 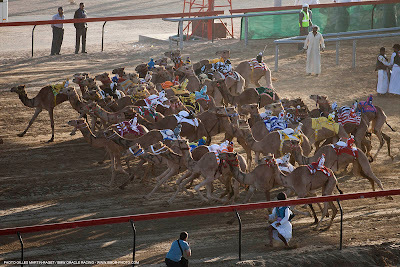 The camels race around a 4km (2.5 mile) horseshoe track in heats that last between 6 and 7 minutes. While the camels are sprinting around the track, a fleet of cars give chase on inner tracks. The lane closest to the track is for the TV crew. The next lane is for the owners of the camels and the outer lane is for spectators and supporters. 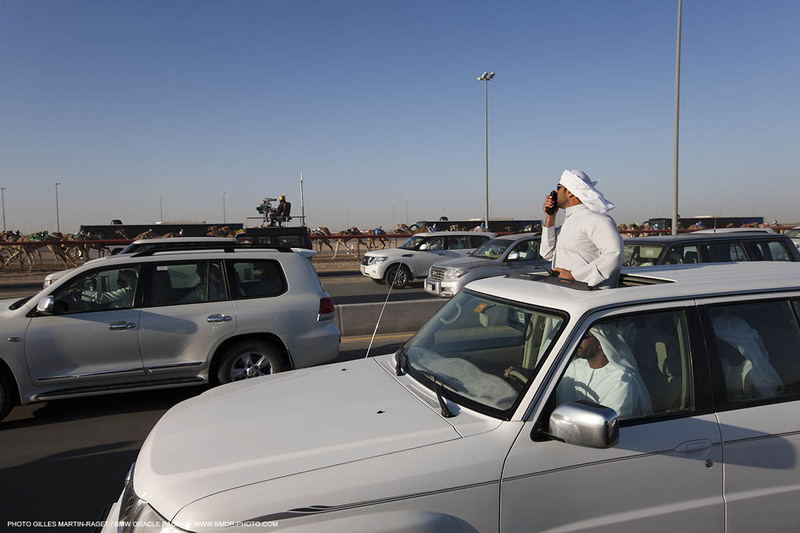 The owners control the robot jockeys with radios that actuate a whip that spurs the camel to run faster. 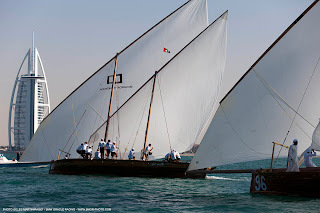 In the afternoon, it was back to the sea for racing traditional dhows. 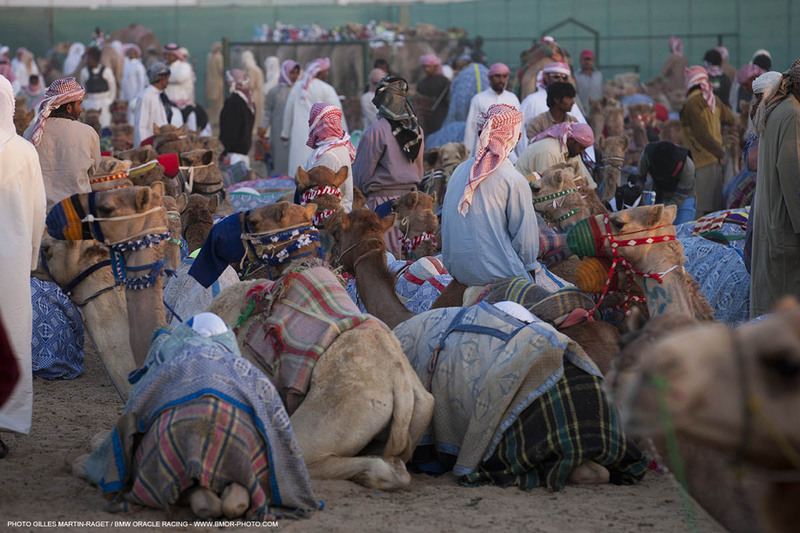 The dhow has plied the waters of Arabia for hundreds of centuries as a trading vessel. 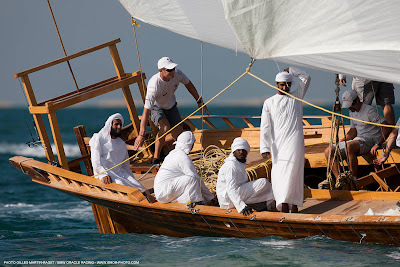 Today was the first day that non-Emirati were allowed to race aboard the dhows, which are built of teak and measure approximately 60 feet in length. Twelve BMW ORACLE Racing team members were aboard for the day, including (kneeling, left to right) Julien Di Biase, Jeff Causey, Dirk de Ridder, Revelin Minihane, Chris Schirmer and (back row, right to left) Murray Jones, Criag Schirmer, Cathy Ryan, Brian “Puck” MacInnes, Matt Mason, Ian Moore and skipper James Spithill. 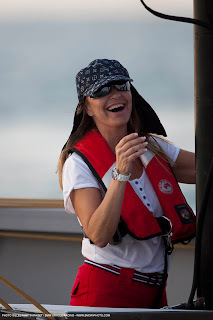 Cathy, the sailing team administrator, had a welcomed day out of the office. 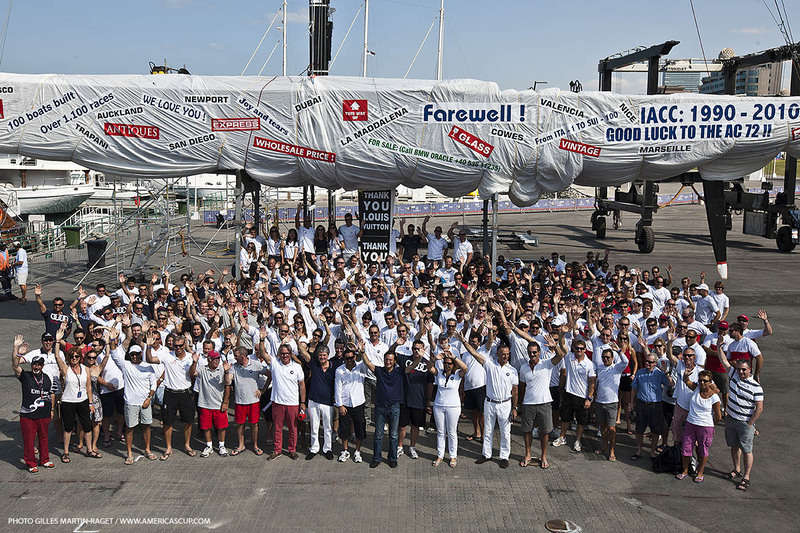 The crew had to hoist the giant boom for the polyester sail by hand. On an ACC sloop, the crew crouches low in the cockpit to reduce windage. 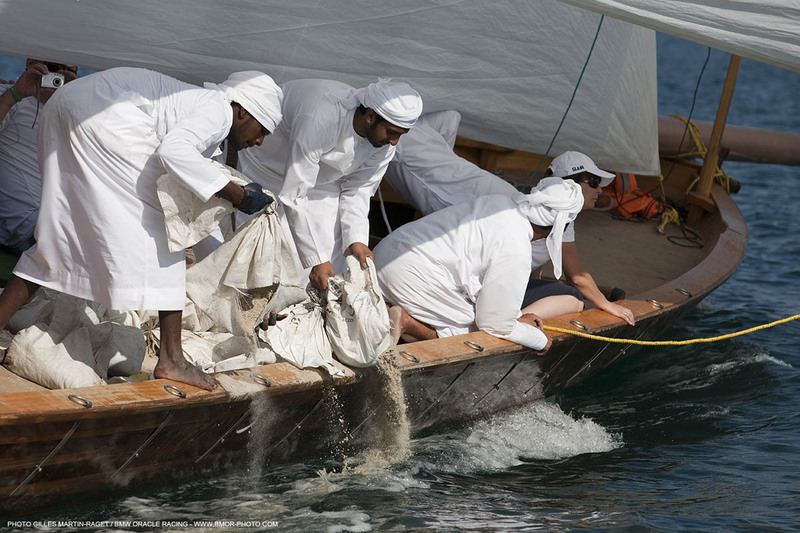 On the dhows, they were asked to hike from the rigging to aid stability. And when the wind got light, the regular sailors dumped sand from the ballast bags. Skipper James guided the crew to 3rd place in what was an enjoyable day for all.